Voyage To Amasia is inspired by Eric V. Hachikian's piano trio of the same name. 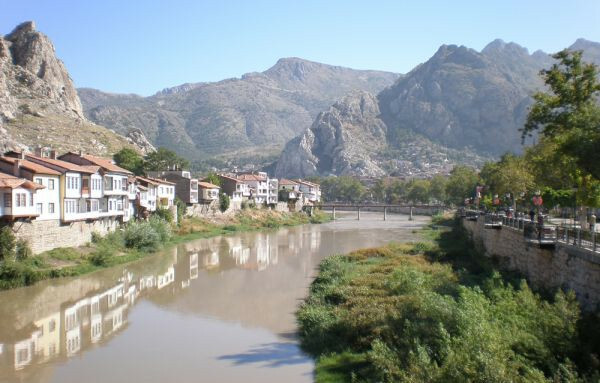 Amasia, Turkey, is the city from which Eric's grandmother fled during the Aremenian Genocide. The film traces a path through the past, honoring Eric's grandmother and uncovering what her life in Turkey might have been like. It also explores how the events of nearly a century ago continue to strain the relationship between Armenians and Turks today. Inspired by one family's story, the filmmakers’ embark on their own journey in hopes of finding a greater understanding between two peoples still at odds. Voyage to Amasia Film, Inc.
Randy Bell is a Washington, DC-based independent filmmaker. He received his Bachelor of Arts from Harvard University in 2000, and his Master in Public Policy from the Harvard Kennedy School of Government in 2010. His documentary films, which explore subjects as diverse as American popular music, mid-century European modernist architecture, and the AIDS orphan crisis in Kenya, have won awards from the Cleveland IFF, the New England Film and Video Festival, and the Ivy FF. They have been honored by the Academy of Motion Picture Arts and Sciences, the African Studies Association, and Harvard University. And they have been screened on television, at film festivals, independent movie theaters, and universities internationally. He is a Co-founder and Artistic Director for film and video at The Tank, a non-profit space for performing and visual arts in Manhattan. Look Back Don’t Look Back (1999). Modest Scarring (2001), Orphans of Mathare (2003), For Seid, Mimi & Amelezewd (2006), Jean Prouvé: A Tropical House (2007), Jean Prouvé: A Tropical House (2007), Surviving Kenya (2008), African Lens: The Story of Priya Ramrhaka (2008), Voyage to Amasia (2011). Eric V. Hachikian is an Armenian-American composer, whose music has been hailed by the New York Times as "lovely and original." He studied Nadia Boulanger's methods in Paris, France, and has also studied composition and audio engineering at the Aspen and Tanglewood Music Festivals. He received his Bachelor of Music from the University of Michigan, and his Master of Arts from New York University. Also a performer, Eric plays the piano and tuba, is a classically trained vocalist, and an accomplished conductor. His compositions and orchestrations can be heard in a variety of major motion pictures (Project X, 50/50, The Wrestler; New York, I Love You) and network television shows. As Creative Director and Co-founder of Soundcat Productions, a music house based in New York and Los Angeles, Eric has written and produced music for national and international ad campaigns. He has also written for Off-Broadway productions, and his compositions have been performed by the Los Angeles Philharmonic, the New York Pops Orchestra, the Baltimore Symphony, and the Boston Pops Orchestra. A classically trained composer, as well as a self-taught DJ and perpetual student of world music, Eric's musical instincts have no boundaries, and his multi-genre interests result in a personal sound.